When it comes to DIY painting, many homeowners can agree that sometimes this task is much easier said than done. 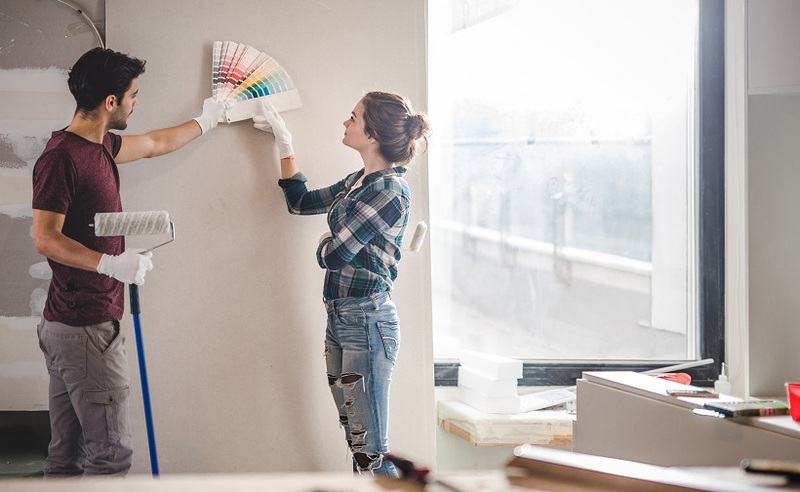 Painting your own home may seem like a fairly straightforward task, but anybody who’s been through the process knows that a quality painting job well done requires strong attention to detail. There’s nothing worse than peeling back that blue masking tape at the end of a painting project only to discover messy lines, or worse, paint splatters all over your baseboards. 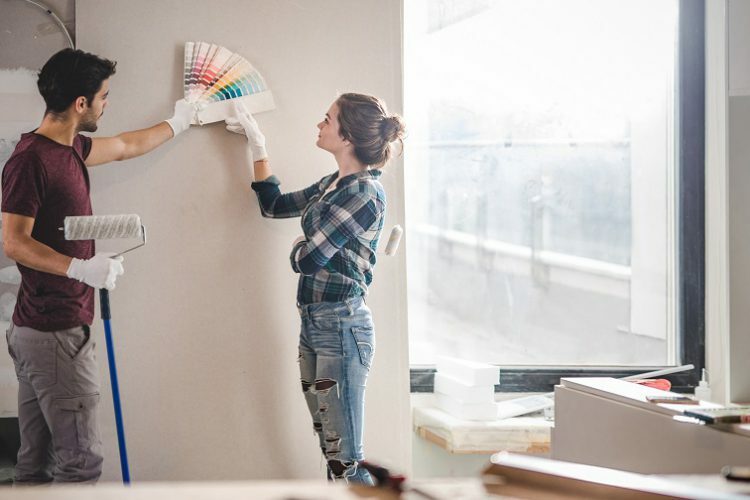 To help you avoid a DIY painting disaster, our San Jose construction team has put together a list of their top 7 tips for interior painting. Nothing will sabotage your DIY paint job more effectively than a wall full of holes, dents, cracks, or other imperfections. After you’ve cleared away furniture, artwork, and anything else that may have been obstructing your walls, take some time to carefully inspect the surface you’re planning to paint for any imperfections that may need correcting before you’re ready to start painting. Be prepared to spend as much time as necessary patching or filling in uneven surfaces, and don’t forget to carefully sand away excess product to create a uniform surface. Most DIYers know to protect borders with masking tape, but this is absolutely not a step to be rushed through. Simply placing masking tape or painter’s tape on trims and baseboards isn’t always enough to prevent unwanted paint splatter. Use a putty knife to gently press the tape into the trim to minimize gaps and lower the risk of unwanted paint drippings ruining the project. Remember there’s no such thing as being too careful when it comes to a DIY home painting job. In addition to taping around trims and baseboards, go the extra mile to cover your doors and windows with a layer of protective plastic. Taking the extra precaution to avoid unwanted paint splatter is a careful step that even the most experienced painters take, and DIYers are wise to do the same. One of the biggest mistakes homeowners make is using plastic drop cloths to save money on their painting projects. Canvas drop cloths are a much better choice, as they’re much more durable and can be reused for future painting projects, whereas plastic drop cloths often rip and tear. Keep in mind, too, that when paint spills on plastic, it will spread and stay wet, while the canvas drop cloths will catch and absorb spills. In the long run, canvas is not only a more reliable choice, but since it can be reused, it’s even more cost-effective than plastic. Unfortunately, there’s just no way to guarantee that every can of paint is exactly the same color. Instead of opening one paint can at a time and running the risk of having slightly different hues throughout the room, combine your paint cans into one single bucket and stir them together to create a single shade. If you’re considering painting the interior of your home yourself, buying some paint trays and rollers probably seems like the obvious choice. You may be surprised to find out, however, that there’s really no reason to waste time and energy trying to pour paint into a tray, where it can harden overnight if you’re not careful. Luckily, there’s a much easier solution professional painters use, and it’s called a paint grid. Paint grids are metal or plastic screens that can fit right inside your paint bucket, where you can dip your roller, and remove excess paint by running it over the grid. At the end of the day, or when you’re ready to take a break, simply drop the grid inside the bucket and cover it with a lid. To ensure your walls will have a uniform texture and sheen, carefully clean dirty surfaces and apply primer prior to painting. This will not only extend the life of your paint job by preventing chips and peeling, but is also an effective way to blend in any patchwork you may have done. Skipping this step could result in a spotty or uneven-looking surface, even after you’ve finished painting. Lap marks are made when paint is applied sloppily or in an uneven manner, resulting in inconsistent layers of color. To prevent lap marks, paint in single, continuous roller strokes whenever possible. For larger spaces that cannot be completed in a single stroke, feather out the edges of the paint to prevent obvious color buildup in the places you’ll be covering more than once. This will create a solid, seamless covering of color and result in a more professional-looking paint job. Your house is more than just a piece of property, and our team understands the importance of a quality home improvement project. That’s why at Intempus, we work hard to give you the tips and instructions you need to make your house a home to be proud of. If you think you’d like help with painting your home, contact us today for more information on how the best construction company in San Jose can assist you!